Link to photos of "Inner Islands"
Link to photos of birds, turtles, crabs, etc. The Republic of Seychelles is an island country just south of the equator in the Indian Ocean, consisting of hundreds of islands. There are some 20 "inner" islands consisting of granite from the supercontinent Pangaea. In contrast to most other isolated oceanic islands, the Inner Seychelles are NOT volcanoes that are relatively young; the Inner Seychelles are, geologically, very old! By far the largest of the "inner" islands is Mahé, measuring about 155 square kilometers. Mahé also has the highest top the archipelago, at 905 meters. The islands were uninhabited when they were colonized by the French around 1750. Around 1800 the islands became British. In 1977 the country became independent. All islands have a tropical climate. The rainy period is from about December to March. 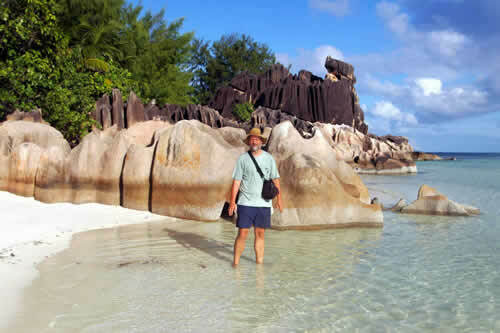 The "inner" islands consist of beautiful granite formations, tropical rain forests and many coralline and sandy beaches. Cultivated land is quite scarce; apart from fish, most foodstuffs have to be imported. 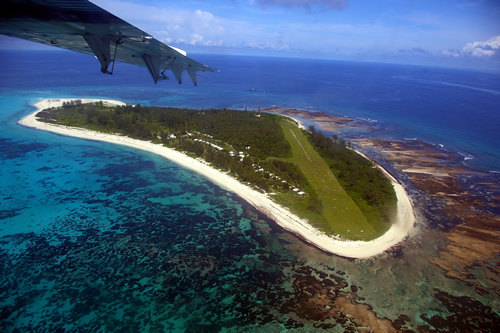 The total population is about 100,000, of which about 80,000 in the island of Mahé. The major sources of foreign revenue are fishing and tourism. The islands are very popular by international tourists, who enjoy themselves with walking, snorkeling, diving. Some islands are resorts, and others are nature reserves - with many birds, turtles, crabs, etc. My favorite is Bird Island, a coralline resort and nature reserve with a size of only 100 hectares, with perfect ecotourism; some 25 people are working there, and the maximum amount of visitors is about 80.